The United States are the largest market worldwide in terms of consumer restaurant spending. In 2016, almost one quarter of consumer spending in the industry was attributable to the U.S. market. Food and drink sales in the United States have grown from 379 billion U.S. dollars in the year 2000 to almost 800 billion U.S. dollars in 2017. This is also reflected in the number of restaurants and other food and drink establishments in the United States. In the fall of 2017, the total U.S. restaurant count reached around 647 thousand units. The food service sector includes catering services, coffee & snack shops, food delivery providers and others. The restaurant sector, on the other hand, is comprised mainly of independent or chain full-service and limited-service restaurants (FSRs & LSRs). FSRs are establishments primarily focused on providing food services to patrons who order and are served while seated and pay after eating. In 2016, total FSR sales in the United States amounted to around 300 billion U.S. dollars. LSRs on the other hand are restaurants where patrons generally order at a cash register or select items from a food bar and pay before they eat. In 2017, limited-service restaurant sales totalled more than 230 billion U.S. dollars. Food delivery is also a popular segment of the industry, especially pizza delivery services, on which U.S. consumers spent around 10 billion U.S. dollars in 2016. McDonald’s is the most valuable restaurant chain company both worldwide and in the United States. In 2017, the company had a brand value of almost 100 billion U.S. dollars – more than double its closest competitor, Starbucks. Comparatively, the leading FSR restaurants are far behind the 36.4 billion dollars’ worth of sales McDonald’s achieved in 2016. 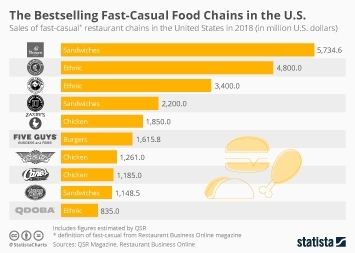 The top chain in terms of sales being Applebee’s, bringing in a total of 4.4 billion dollars in 2016 with its competitor Olive Garden coming in at a close second with 3.9 billion dollars. In the food delivery segment Domino's Pizza is the industry leader, with more than 5 billion U.S. dollars in sales in the United States alone.